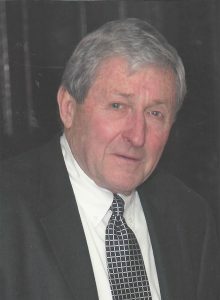 Of Amesbury, passed away suddenly on April 4th at Maine Medical Center, Portland, Maine, at 82 years. Proud son of the late James Francis King and Mary Kelley King. Beloved husband of Geraldine “Gerry” (Cicchetti) of Amesbury. Loving and devoted father of Kathleen L. Lopez & husband Brian of Lynnfield, Lisa King Cormier & husband Marc of Peabody, Lynda M. King of Haverhill, James F. King & wife Michele of Georgetown, Karen E. King Bourcy & husband William of Haverhill. Cherished uncle of Suzanne L. King of Everett and Kristin E. Cuccio of Charlestown, who were daughters to him. Dear brother of Elizabeth King Carmichael of Winthrop, James F. King of Key West, FL and the late Blanche King Lawton. Brother-in-law of Kathleen Spaulding and husband David, Jack Goshtigian and his partner Ellen Smith, son Nathan Goshtigian and grandson Blaise, Gayle Leslie Greene, son Christopher Keene and Fiancé Jessi Declerq and daughter Nicole Keene and survived by the mother of his children Janet Siemasko of Lynn. Loving and devoted grandfather of Melissa Marsh & her partner Roberto Paramo of Madrid, Spain, Ryan Marsh & wife Hayley of Nottingham, N.H, Jessica Marsh & fiancé Shaun Sauchuk, of Billerica, Katie Nocella & husband Robert of Peabody, Sarah Cormier and her partner Joe Dunajski of Salem, Matthew Cormier of Peabody, Jeanette King Gieger and husband Mike of W. Newbury, Michael King of Georgetown, Rachael Castro and husband Alrome of Newmarket, NH, Erin King and her partner John O’Leary of Georgetown, Elizabeth and Joseph Bourcy of Haverhill, Danielle Lopez of Colorado Springs, CO, Kyle Lopez, and his finance Tanya Taylor of Peabody. Great Grandfather of Adrian Paramo, Sophie and Spencer Marsh, Shaun and Christian Sauchuk, Christopher Geiger, Victoria Castro, and Mia and Colten Lopez. Family and friends are invited to attend the funeral from the Vertuccio & Smith, Home for Funerals, 773 Broadway (Route 107) REVERE on Wednesday, April 10th at 10:00 a.m., followed by a Funeral Mass in Immaculate Conception Church (Corner of Winthrop Ave. & Beach St.) REVERE at 11:00 a.m. Services will conclude with interment in Woodlawn Cemetery, Everett. Visiting Hours will be held in the funeral home on Tuesday from 4-8 p.m. Parking is available in lot left of the funeral home. Bill’s career was in telecommunications, retiring from Verizon and continuing on to run Wireless Communications LLC. He was most proud of his family, which brought him great joy and happiness. He was truly the light of their lives. He lived life to the fullest, had a love of photography and photographed every moment. He loved hiking, being active outdoors, and was an expert marksman. He was a friend to all, kind, generous with a beautiful soul that welcomed you in from the very moment you met him. Late U.S. Navy Vietnam Era Veteran. Tuesday, April 9th from 4:00 p.m. to 8:00 p.m. In lieu of flowers, remembrances may be made to the N.E. Center and Home for Veterans, P.O. Box 845257, Boston, MA 02284 or to Company 2 Heroes by visiting www.company2heroes.org. I am so sorry to hear of your dad’s passing. To Gerry and all of Bill’s children, grandchildren, great grandchildren and extended family, we are very sorry for your loss. We are truly saddened to the core by his passing. Bill was a very special human being. He was a dear friend to me and my wife Jackie, and most certainly he will be greatly missed by those that knew him. We will keep him in our hearts and prayers. May he rest in peace. Gerri and family, I’m taken back by Bill’s passing and so very sorry for your loss. Bill was a great friend, we all enjoyed his visits to the office just to check in and talk about our next trip to shoot clays, when Bill came by everything came to welcomed stop. I am devasted to hear of Bill’s passing. My heartfelt condolences to you Gerri and all of Bills family. Second to the loss of my husband this is a deep deep loss, Bill has always been in my life. My prayers are with you all.